DesIf you are fed up of mediocre income and all the short-term money makin gfads you've been trying, it is time you put these behind, strp yourself and get rady to become the next marketing ace! How would you like to start banking in predictable income and generate windfall profits at a minor expense of working just a few hours a day - and do it for a long, long time to come? Of course you would. Who wouldn't want to?cription...If you have been immersed in the Internet Marketing space for at least a few months, surely you have seen some fads come and go. Make money from Facebooking is not something I would call a 'solid business model' - not when the social network keeps changing every now and then because Mark Zuckerberg and his team feels like it. The Adwords and Pay-Per-Click game is not like what they used to be. As soon as some keywords start yielding high value you will pay more per click and eventually your conversions and back-end funnels won't be enough to cover even your up front cost! Even the affiliate marketing game changes. Old redundant promotion techniques like whipping up a one-page review site get shortlived when everyone else picks up the same method and do it too! You may have witnessed some of these trend changes. And they all have one direction in common: DOWN. If you have to keep learning and relearning new techniques to ride on every trend, making money online is going to be a struggle. And how LONG can you last? The Short Answer To The Long Problem: Go Get Your Own Mailing List. It's tried. It's tested. It stands the test of time. You won't be at the mercy of shortlived trends because email is an essential Internet tool - and everyone with an Internet access has an email account. Once you get people onto your mailing list, it's yours. They have already given you their permission to email them, and you can be making money just sending emails to them. How long does it take to write an email? No more than five minutes of your time. How much money can you make? Well, the more email subscribers you have, the more potential income you can make - literally with the click of the mouse! If You Don't Already Have A Mailing List, You Don't Have A Business. 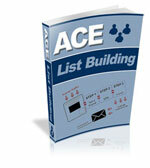 By 'mailing list' I don't mean just a list of names and email addresses. If no one on your list is a willing buyer, you can't start lining your pockets. While most Level 1 amateurs don't have a list (and resort to animal instincts to make money online), I suspect the Level 2 marketers already have their own autoresponder and may have some subscribers already. Except that they are not making money yet. You need a pool of hot, hungry buyers waiting to give you money every time you ask for it - not an ocean of tire-kickers.